Crewel Embroidery: Wool Threads – What Colors? Oh, golly. Picking out threads for an embroidery project is Hard Work! ‘Course, as work goes, it’s the kind of Hard Work I can really get into. It isn’t quite the same as cleaning bathrooms, is it? Here’s my thread-sifting adventures for the Crewel Rooster project. I’m going to be working this crewel embroidery project much like a sampler – a kind of off-the-cuff sampler. There’s a dual purpose behind this project. The first point is to play with different wool threads that are available on the market and see what they’re like, and especially, what they’re like in comparison to each other. 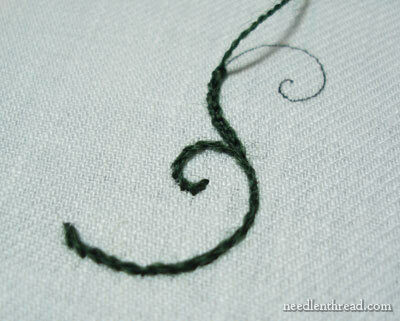 The second point is to play with stitches that are typical of crewel embroidery. All of my threads for this project are coming from my stash. So, unlike the designer who designs a project, works out the colors on paper, then picks out suitable threads to carry out the project, I’m sort of winging it on the color choices. For the sake of this particular project, it’s the type of thread more than the color choice that is moving me in my selection. Now, don’t get me wrong – I’m going to try to coordinate things so that the poor rooster doesn’t end up looking like a blob of discombobulated colors. But my choices are limited entirely to what’s in my stash. Ok. Admittedly, there’s no dearth of Appleton crewel wool here. I have some hundreds of skeins. I’ve never counted them. I really don’t want to know how many are there. They stuff into a medium sized plastic garbage bag. I haven’t taken very good care of them. I wouldn’t be surprised if one day, they just up and decided to felt themselves. Besides the Appleton, I’ve got the leftovers from a couple of the crewel smalls kits I’ve been working lately. These are Heathway wool threads and Gumnut poppies – mostly Heathway. And not a lot of either. I have these skeins of Fine D’Aubusson, made for Au Ver a Soie and distributed by Access Commodities. These threads will be available in the States this month, I think. Then I have this kind of odd-ball collection of threads. The hank in the back, I think, is crewel-weight Paternayan wool. It’s only marked with a color number and price tag, but I’m pretty sure I bought this off the wall at a needlepoint shop under the Paternayan wool sign. But I could be wrong. Oh, the disadvantages of not writing things down!! Then there’s a Bright Red skein of Bella Lusso, which is 100% merino wool from Italy, and then three cards of Gentle Art Simply Wool, which is a rather fine wool embroidery thread that comes in a very limited range of colors. These are the colors I chose out of the Appleton pile. 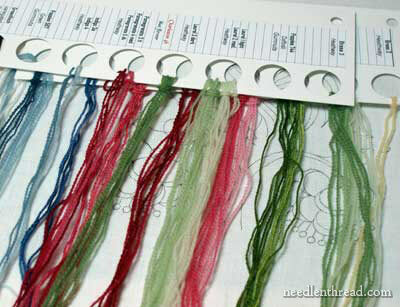 In addition to the above threads, I’ll also be using some Renaissance Dying crewel weight wool, if the colors work out. 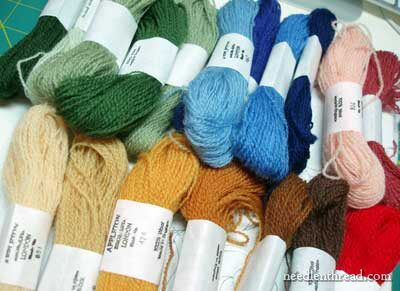 I need to dig those out – I think I have at least a couple colors of these threads. These are wools made from vegetable dyes, by the way. Kind of neat process and interesting website, if you want to visit Renaissance Dying and read a bit about what they do. So I picked out all my threads, and assembled the framed fabric ready to embroider, the threads, my tool box, and a little “doodle hoop” into a smallish basket to house the whole project while I make my way through it. What’s a doodle hoop? It’s a very handy item to have in your work basket when you’re making your way through a project. I’ve hooped up a small scrap of the linen twill, so that I can test out different threads or stitches before I use them. When you’re working with a thread that’s unfamiliar, it’s nice to have an idea of how it’s going to work before you use it on your project! And, finally, yes – I started. And boy, do I regret this! I wanted to get blue into the piece, but I thought that it might be difficult working blue into the tail of the rooster (Does it really matter? Probably not…) So I decided to do the flowers in blue. Not just any blue – I wanted a deep, bright blue, like a crisp Autumn sky on a chilly day. 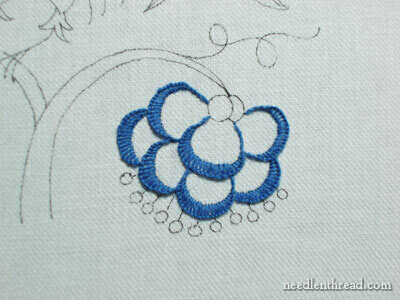 I used buttonhole stitch on the flowers, with the darker of the two blues I selected. And then I went through stitching-and-picking-out-hell, trying to figure out what to fill the rest of the petals with. Any comments? Suggestions? Advice? Any ideas for filling those petals? Oh my goodness, it looks gorgeous! is the design Jacobean? I saw a cockeral at the weekend and he had a very fine petrol blue tail. I didn't catch up with you posts until after I saw him, otherwise I would have taken a photograph for you. I love the blue flower and personally would not fill the petals, I like them just as they are. 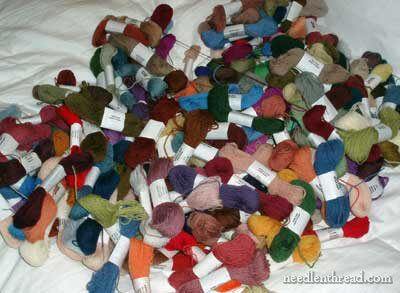 I wish I had 1/4 of your wool thread stash!!! Actually, I don't have a comment, but I do have a question. I am severely allergic to wool of any sort. What fiber would you recommend to replace wool when doing crewel? Wow! Mary, That stash of yours is beautiful and now I am going to cajole my sister and brother to go yarn hunting for me and send me the wool for embroidery asap. But I will still use the stranded cotton to stitch along. Mary- It's interesting to me that you still go through so much "anxiety" (for lack of a better word) over decisions, even with all of your amazing experience. I guess that helps me accept that process for myself. Thanks for all you share here on this blog. Yes, it's a lot of wool! But for those of you haven't stitched with wool, do understand that it isn't the same as stitching with cotton or silk. Some people just Can't Stand stitching with wool. It does have its little troubles, which I'll be discussing as we go along with this project. Diane – the allergy question is a serious one. They do make some synthetics, but they are a pill to stitch with, and pretty awful in general, in my opinion. I'd stick with cotton – if you want the thicker look of crewel embroidery, use pearl cottons, size 5 and 8, I think. You can also use cotton floche. I love the blue. Have you considered something like a red or perhaps something in that color family to fill? Does it have to be another blue color? This is so inspiring to watch and I can wait for the next installment. Cynthia Nicole has written my thoughts. Thank you Cynthia. And thank you Mary for being honest about your problem solving. A great confidence booster, that's for sure. Like, I'ts ok to make mistakes AND ok to talk about them. I seem to have spent a lot of my life stubornly not acknowledging my mishaps in life. I have a little more courage now and find it helps me and others appreciate it. A sense of humour helps too! Also, I really love that blue. Does it have a shade name or number Mary? I try not to be too exacting now (that's another story!) but… I feel I NEED that blue. (no, want doesn,t come into it, ha!). This whole exercise is so very interesting. Great crewel stash … 🙂 ! Your flowers are looking great… I love that blue ! I sometimes get anxious about my projects, specially when I want to start a particular one and have not been able to do so or I need some supplies for it … yeap…. it can even take my sleep away. 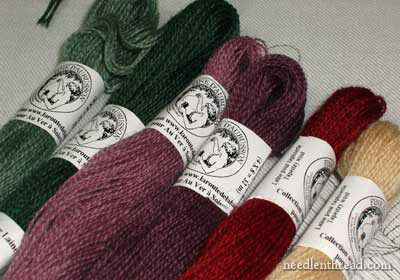 I do have some Medici and 2 skeins of Appleton but will like to try something else (the "thinner" the better). I went to local needlework shops but they only had needlepoint wool… so thick ! Thank you, Mary, for your help with the type of thread to use. It will help me save time trying different things. I haven't blogged yet about resources for threads, actually… I'm not sure where the Fine D'Aubusson will be stocked. I think it's coming onto the market just this month in the US (Jan 2010). You can buy Appleton wool through The Wooly Thread. Thistle Needleworks sells Gumnuts. For Simply Wool by Gentle Arts, you can find those at Needle in a Haystack – but they're about 25 – 35 cents more per skein there. 1-2-3 Stitch! carries them for $3 / skein, but I've never ordered from there, so I'm not sure about their service. Bella Lusso is also available at Needle in a Haystack. I'll be blogging a bit about the threads – which I like best, what the differences are, etc. – soon. I wanted to get a good feel for stitching with all of them first! Hi Mary, funny (in an ironic way)that Diane mentioned not being able to use wool for crewel, as I visted my favourite Threads shop yesterday to discuss which threads to use for my rooster project and the lovely Sue & I decided that Coton Perle, probably 3 or 5, along with stranded cotton used in 2 & 3 strands widths, would be better for my project on the quilters cotton. I'm off to town tomorrow to use my $20 voucher & start marking out my colours. Thank you also for the tip about using a doddle hoop as I will definitely need one. Love the rooster! Thanks for the hint about using perle cotton instead of wool. I have a bunch of perle (sadly bought when a local needlework shop shut down due to the owner retireing), but very few wool leftovers. Question on ripping out – do you do it such that the yarn is re-usable, or "rip-and-toss"? I have a beard trimmer I bought for ripping seams for sewing (works great! ), and wonder if it's false economy picking out stitches one-by-one. Sometimes after that work, the re-stitching with the same yarn looks like $#%% and I end up ripping and tossing anyway. Maybe I should just reach for the trimmer and not even think about saving the yarn? Mary: I second Carol-Anne's suggestion – leave the inner petals unworked. I was going to suggest either using purple, then a white 'center' and calling it a bluebonnet (but I live in TX and see bluebonnets a lot, and that's not the kind of petals they have!) or else using a grid-type fill in gold/orange – but on reflection, I like her idea better! And roosters (like tom-turkeys, peacocks, and other males of the species) frequently have AMAZINGLY colorful tailfeathers – use any color you like there! Would I be able to use this as an embroidery piece? I am trying to use the items I have (for Christmas gifts – go figure) and all I have is embroidery thread and OMG Orange yarn. Thank you so much for this series of posts. I have just decided to try my hand at jacobean crewel work while i am at uni. your website has been such a help. From stitches to patterns i can find anything here. Now I know where to get crewel yarn.I have been looking for this beautiful crewel yarn and you have given me lots of places to look . I do a lot of crewel embroidery work and use a lot of my cats and other animals in my work. And I have found no one who carries such fine wool yarns. 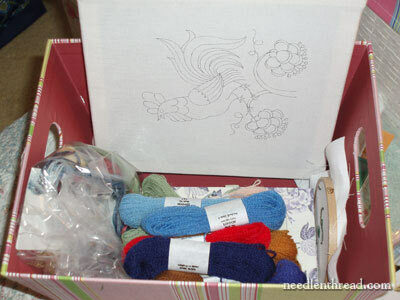 I am also going to be doing this Rooster stitch project soon. I would love to do this rooster. I want to frame it to hang in my kitchen. Would it be just as nice if I use DMC as opposed to wool? hi your as bad as me jumping into a project but your more sane than me at least youve done a few kits first wear im juming in at the deep end lol. 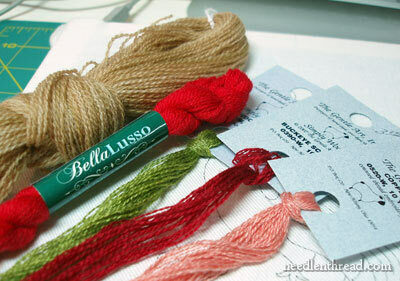 Have you ever come across wool embroidery thread that is not soft but rather very scratchy? I want to reproduce a piece that comes from eastern europe. Hi, Lari-anne – yes, Appleton wool would fit that description! You can find it through Wooly Thread in the US. Hope that helps!